Introducing the JHM B7 RS4 V8 FSI intake spacers. They are 8mm thick and CNC machined out of high quality materials. What do they do? They help bring your intake temps down by insulating the intake manifold from the heat coming from the cylinder heads due to combustion and lengthen your intake runners which in turn creates more torque. With a cooler intake manifold you create a cooler and denser intake charge which helps add more tq and hp, gear after gear! All in all a great mod for the money especially on the RS4 that is lacking in the torque department. With our in house testing we found a gain everywhere in the rev range from 2500 rpm to 8000 rpm. The biggest gains were from 4000 to 6000 rpm, with the 2nd best area of gains from 5000 to 7000 rpm. This was done with acceleration rate calculations in 3rd gear from logs. The BEST part is that we saw that the car didn't slow down after repeated pulls due to an extremely heat soaked intake manifold bringing the intake temps up. Bottom line, the longer we beat on it the better it performed vs. the tests without the spacers. 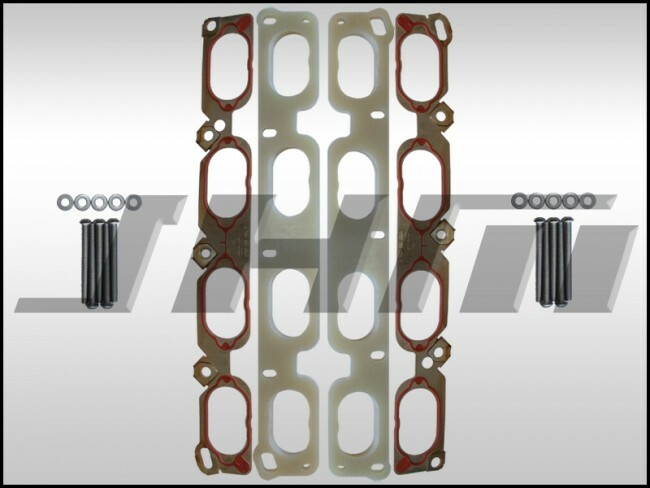 2 - OEM Intake gaskets (1 for the each of the top sides of the spacesr that mates to the intake manifold, you can reuse the stock gasket between the spacer and the cylinder head. )- Lower mileage cars only. If in doubt on the condition of your OEM gaskets select the option below for a second pair of gaskets. Optional Oil Separator Heater Bypass kit for a low price, see dropdown box below. This helps keep the intake temps even cooler and takes 1 minute to install with the intake manifold removed. NOTE: Not recommended for extremely cold climates. Optional Additional pair of OEM intake manifold gaskets if you feel your factory gaskets may be worn out or damaged. 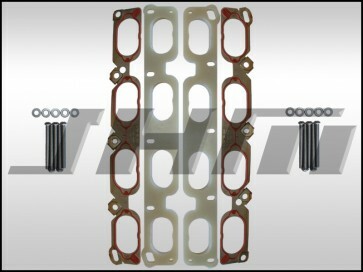 You can reuse your factory gasket at the cylinder head, they are rubber and steel making them quite reusable. Our in house car has 75k miles on it with the original gaskets and after we have removed the intake manifold several times for R&D of these spacers and other products they are still sealing great. The install for these spacers requires the same labor as a carbon cleaning. So when performing a carbon cleaning to bring back your top end horsepower, why not install JHM intake spacers and add some torques as well. NOTE: The only thing additional vs doing a straight intake manifold removal for a carbon clean is that you need to flex and move up the distributor about 10mm (spacer plus additional compressed gasket) for the high pressure fuel lines. You need to adust the fuel lines as well since the manifold will be sitting about 10mm higher than stock.